It's not necessary to break into your computer or smartphone to spy on you. Today all devices in our home are becoming more connected to networks than ever to make our lives easy. But what's worrisome is that these connected devices can be turned against us, anytime, due to lack of stringent security measures and insecure encryption mechanisms implemented in these Internet of Things (IoTs) devices. The most recent victim of this issue is the Samsung's range of SmartCam home security cameras. 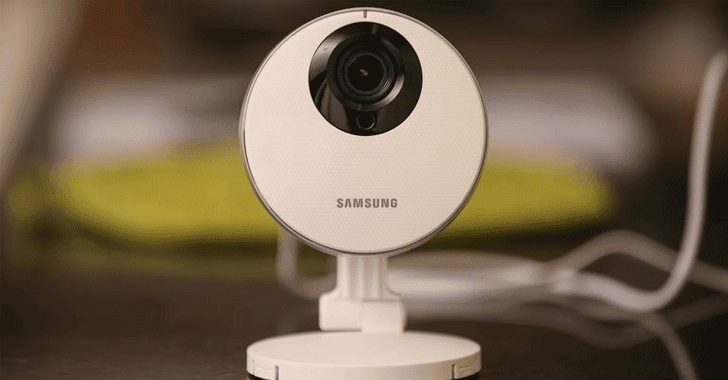 Yes, it's hell easy to hijack the popular Samsung SmartCam security cameras, as they contain a critical remote code execution (RCE) vulnerability that could let hackers gain root access and take full control of these devices. SmartCam is one of the Samsung's SmartThings range of devices, which allows its users to connect, manage, monitor and control "smart" devices in their home using their smartphones or tablets. Back in 2014, the hacking group Exploiteers, which was previously known as GTVHacker, listed some SmartCam exploits that could have allowed remote attackers to execute arbitrary commands and let them change the camera's administrator password. But instead of patching the flaw, Samsung decided to rip out the accessible web interface and use an alternate route that forced its users to run their SmartCams through the company's SmartCloud website. So, it turns out that Exploiteers broke into the Samsung's SmartCam devices again with a different hacking exploit, allowing hackers to view what are supposed to be private video feeds. What went wrong? Samsung had patched the original flaws but left one set of scripts untouched: Some PHP scripts that provide firmware updates through the SmartCam's "iWatch" webcam monitoring software. These PHP scripts have a command injection vulnerability which could allow unauthorized users without admin privileges to execute remote shell commands with root privileges. "The vulnerability occurs because of improper sanitization of the iWatch firmware update filename," a post on Exploiteers website reads. "A specially crafted request allows an attacker the ability to inject his command providing the attacker remote root command execution." This defect, in turn, allows the web management system to be turned on, which was turned off by the vendor. Exploiteers has also provided a proof-of-concept video demonstration that shows their exploit successfully working on the SmartCam SNH-1011 model, but security experts believe all Samsung SmartCam devices are affected. How to Mitigate the Vulnerability? An official patch from Samsung does not appear to be available yet, but the good news is that the folks at Exploiteers have shared a DIY patch that can be downloaded by SmartCam users. However, I personally advise users to wait for an official firmware update from the company, rather than running untrusted code on their devices, though there's no indication yet if Samsung has any plan to issue a proper patch in upcoming days. Another way to mitigate the vulnerability is by keeping your SmartCam behind a network firewall. Samsung has yet to respond on the issue.